There are 4 pool sections at Pirates Village and in keeping with the hotel theme, they are all pirate themed. 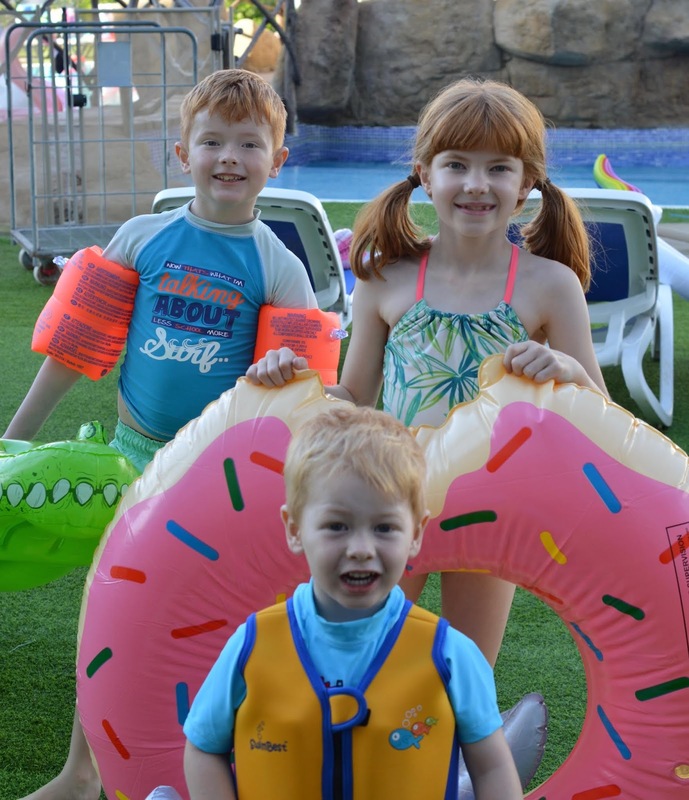 There is a 0.9 metre pool (where the mermaid lessons are held), a toddler splash pool, a shallow pool with slides and a main swimming pool. The main pool is 2 metres deep (yikes) and was ideal for grown-ups and teens. My mam liked having a morning swim in this pool and despite it being October, she wasn't too cold. There was a gradual drop going from 1 metre to 2 metres from the pool side and this was the pool the pirates used to throw or dunk the kids and grown-ups in when they lost a poolside game. Jack was treated to some new boy swimwear and although he can swim, he's not confident yet and I definitely wouldn't trust him in a 2 metre pool so I bought him these Zoggs armbands for ages 6-12 years which simply rolled up Jack's arms - they are the best armbands I've ever used and I'd recommend for older kids. They were so much easier to put on and take off. 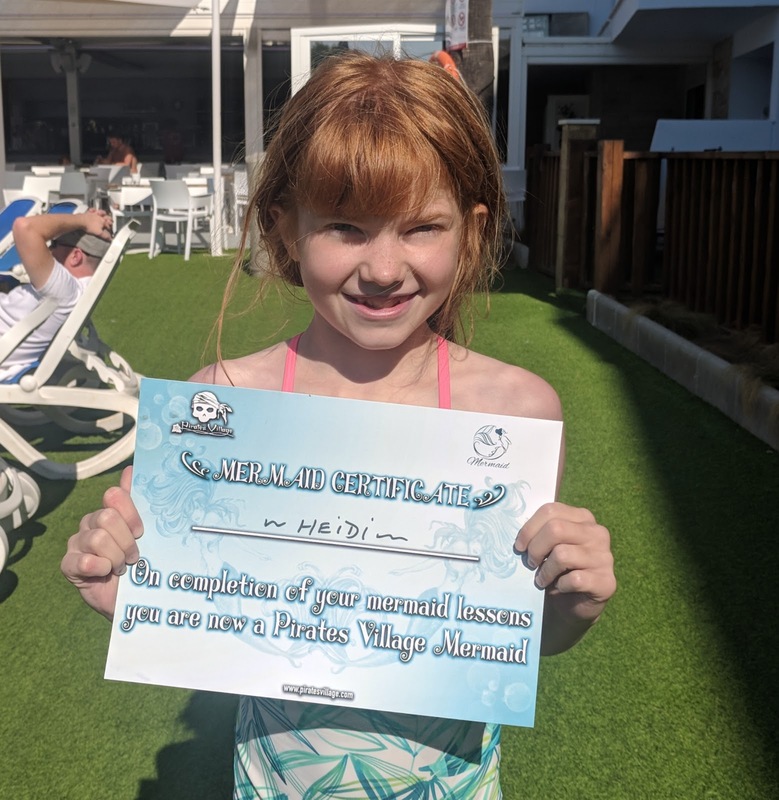 Finally, Heidi is a confident swimmer and has her 30 metre badge but I was still really nervous about her being in a 2 metre deep pool so bought her a life vest and as the week progressed, she removed some of the floats until she felt confident enough without it. The pool has 2/3 lifeguards on duty who were really good - they joined in with some of the games, administered first aid when needed and kept an eye on the kids and made sure they weren't doing anything they shouldn't be (like climbing on the rocks). At night, a fence is put around the main pool stop little ones from falling in (it's right by the stage where the evening entertainment is). 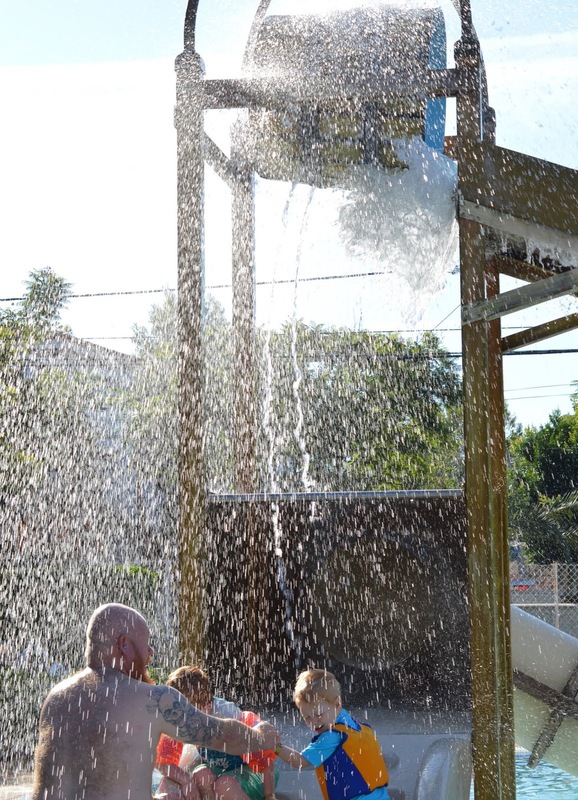 One of the reasons we loved Pirates Village was the pool side entertainment. There's a pirate tower in the centre of the pools and this plays a part in some of the evening entertainment and the main Pirates Attack show on a Sunday afternoon. 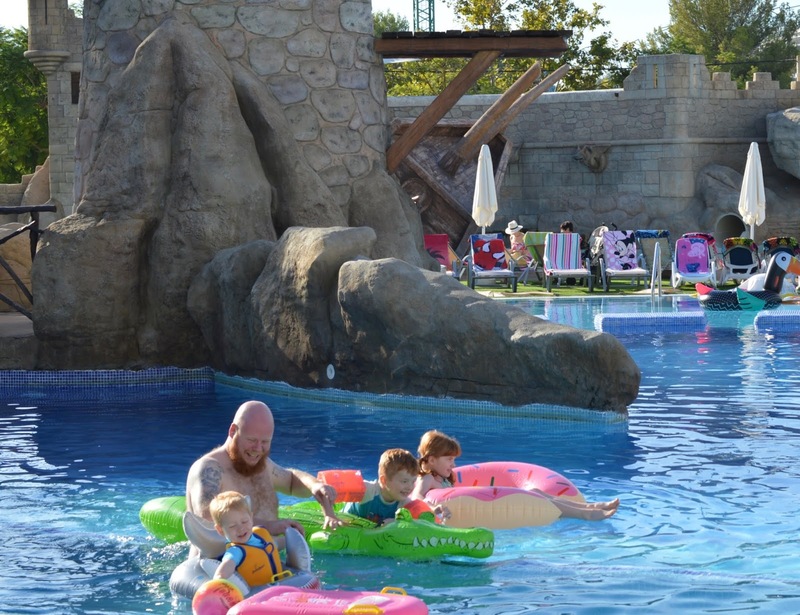 During this 2 hour show, the main 2 metre pool is closed and pirates invade the poolside and pool. 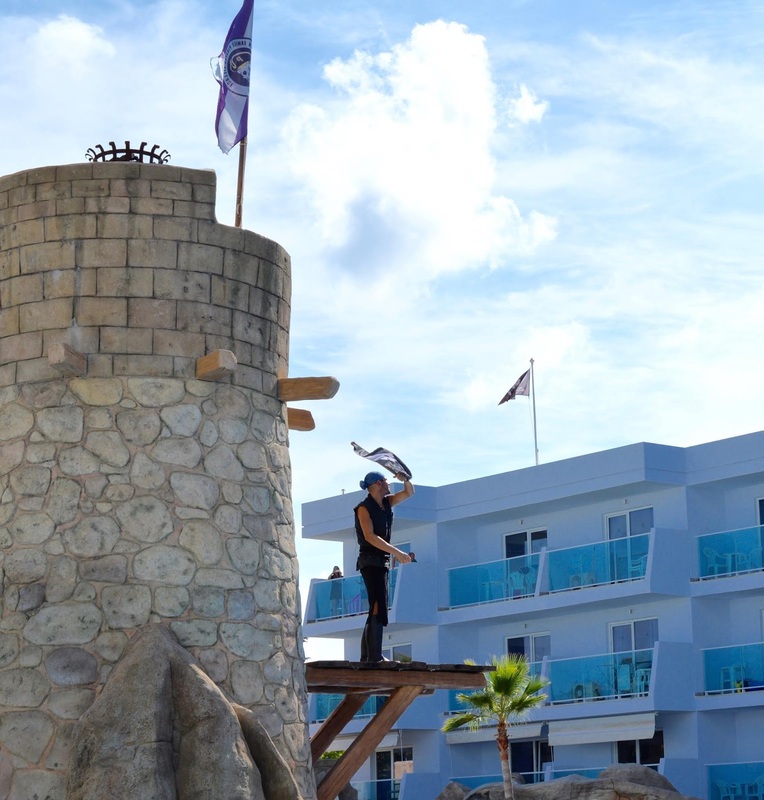 They will steal the grown up's drinks, walk the plank, explode cannons, take part in sword fights and more. It's such a great show and the kids and us grown-ups all loved it. At the end, the grown-ups get the chance to walk the plank too which was such a good laugh. One of the main entertainers Alex instigates a huge poolside water fight every couple of days. Heidi squirted him right in the face at one point and was chuffed to bits when she was thrown in the pool as a punishment. It all might sound a bit crazy and at times it is BUT if your kids aren't into this sort of thing, the entertainment team will not force them to do anything they don't want to and they won't be thrown in the pool if it's going to upset them. You can buy foam water guns from the Chinese Supermarket across the road for 2 euros each - I definitely recommend these for the water fights. 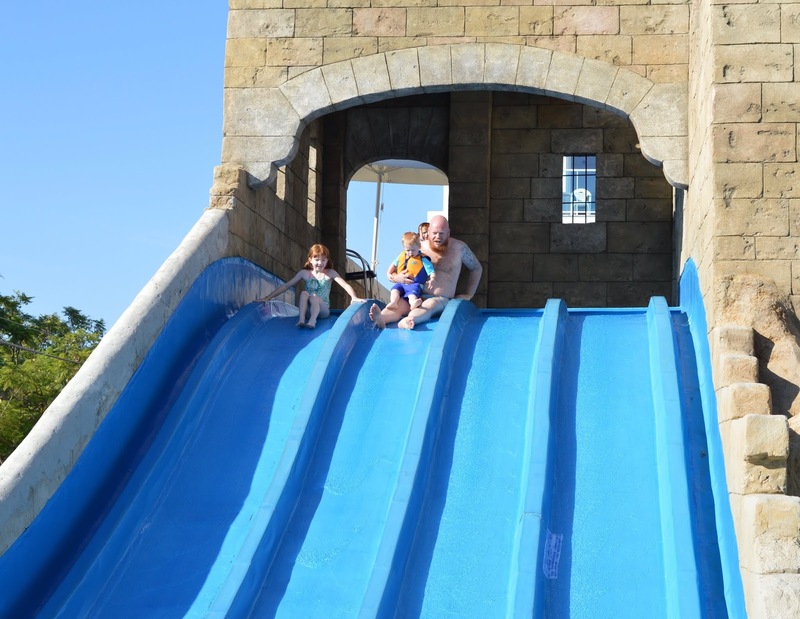 The slide pool is fab and I'm surprised H and J didn't want to spend longer in here - there's a slide you can use your inflatables on, a couple of tunnel slides, a racing slide and a mini slide in the centre which is perfect for younger kids (look out for the tipping bucket though). The pool area around these slides was perfect for toddlers as they could stand up in the water here and it's where most of the parents with younger ones would spend their time. 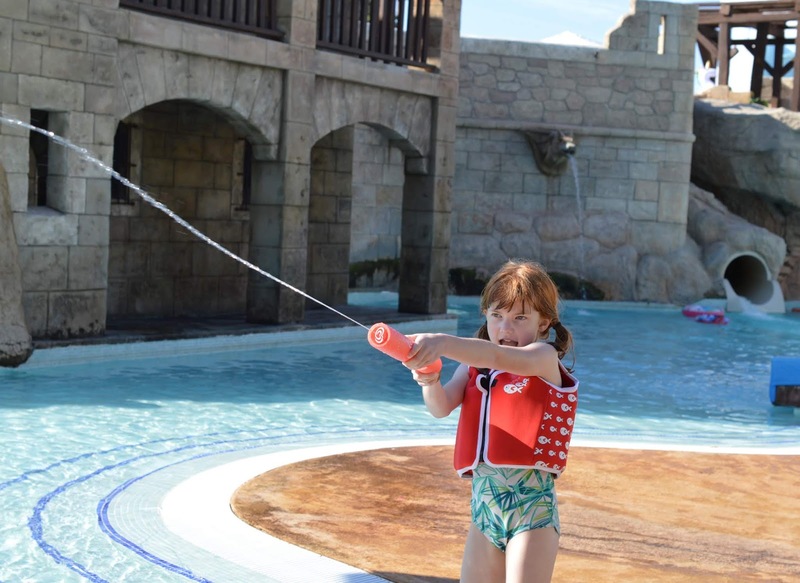 We absolutely loved the pool scene at Pirates Village. The outside of the pool is covered in astroturf which was so much better then tiles, the area was really clean and during our visit in October there were always plenty of loungers (although to be honest we didn't need them has we had our own loungers on our private terrace). 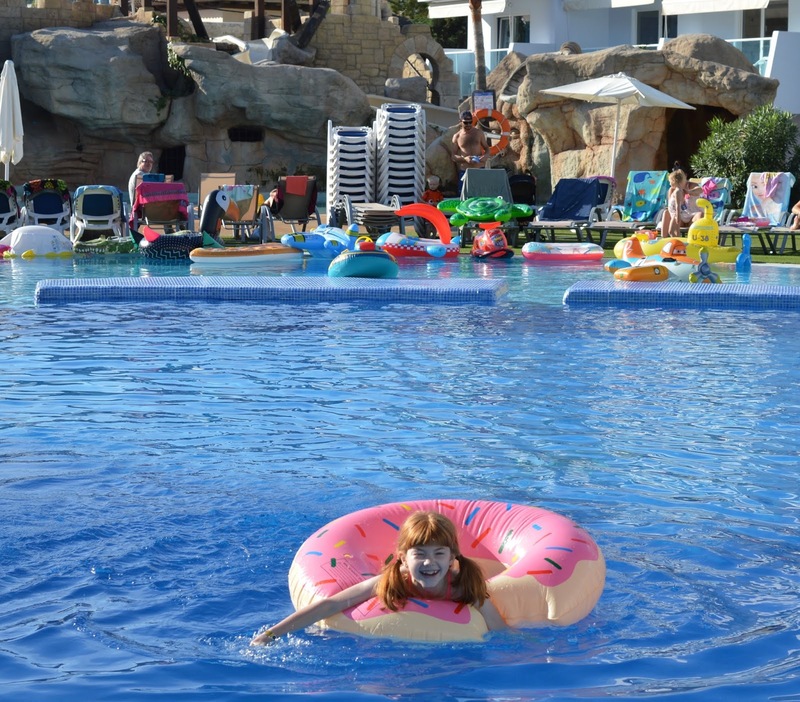 The bar is right by the pool and serves snacks (toasties, chips, onion rings etc...) which are included if you are all inclusive and you can help yourself to beer, sangria, slush, pop, juice, water and ice cream (if you're all inclusive) or order other drinks from the bar. 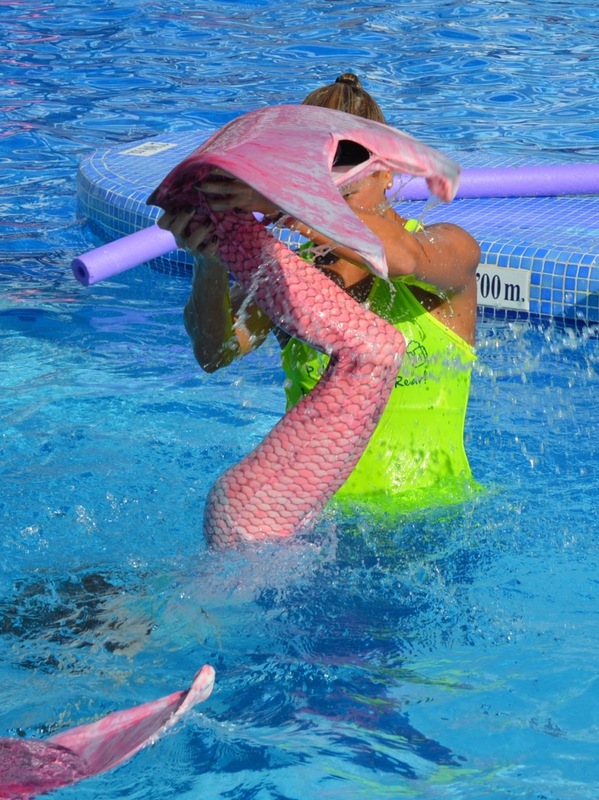 Mermaid lessons take place on Thursdays and Saturdays at Pirates Village and need to be pre-booked at reception. Lessons cost 10 euros per child. This was the only extra we had to pay during our entire stay at Pirates Village and I'd definitely say it was worth it. If you're interested, sign up early in the week as places are limited. 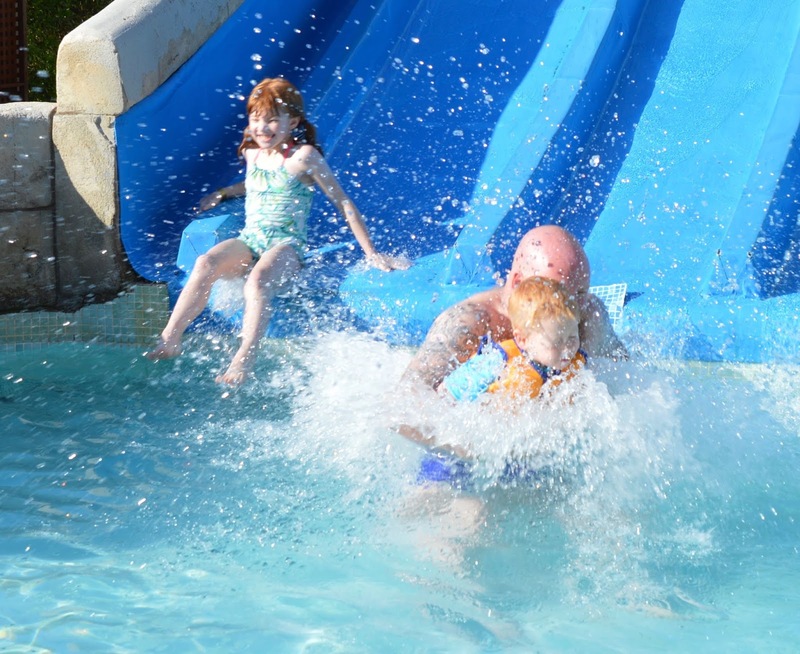 Children must be able to swim and confident putting their face in the water and parents will need to sign a disclaimer. Lessons take place in the 0.9metre pool which Heidi could easily stand up in. The girls from kids club and the entertainment team run the lessons and Heidi was already familiar with the instructors Charlotte and Marta and was super excited and happy to be taking part. 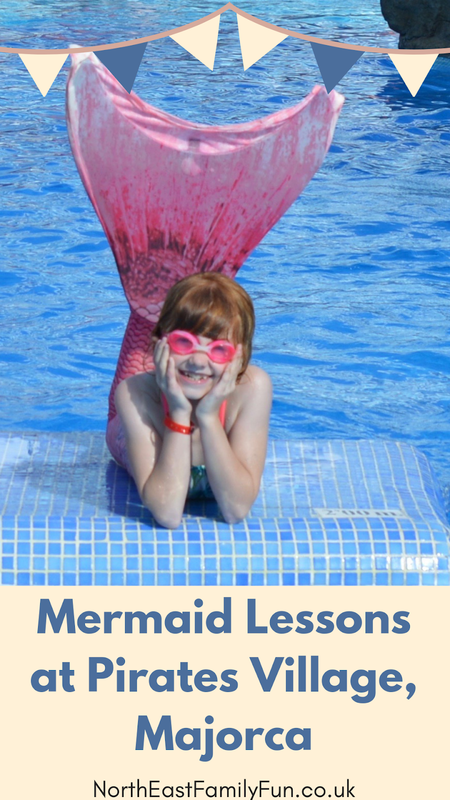 First of all, the mermaids were fitted with their tails and then they learned how to 'clap' like a mermaid which is basically splashing the water with your tail and hands and something they were actively encouraged to do throughout the lesson. 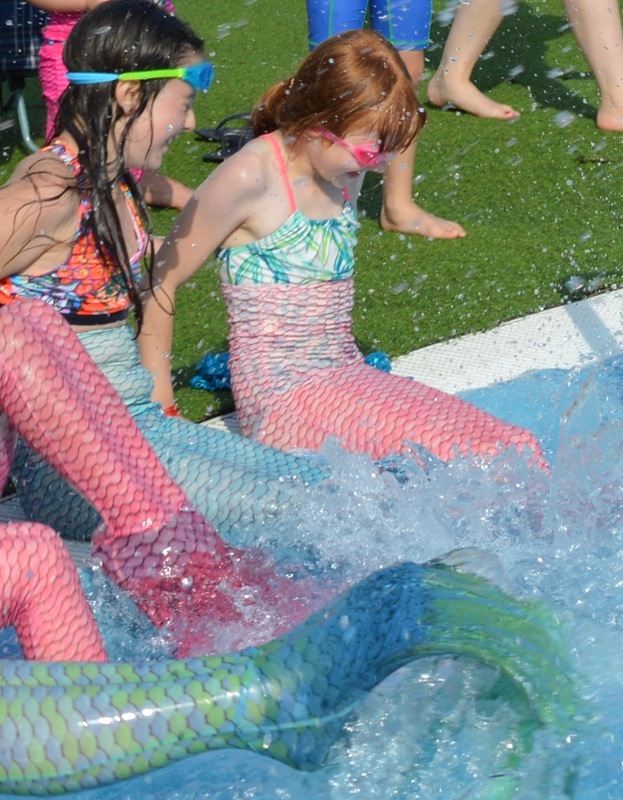 Then it was time for a first mermaid swim with the help of a pool noodle and lots of encouragement from Charlotte, Marta and the other mermaids. Once they had the technique down, it wasn't long before they were all swimming along unaided. They really looked like real mermaids! I know mermaid tails are sometimes controversial and they definitely should not be used unsupervised but the mermaids were perfectly safe. 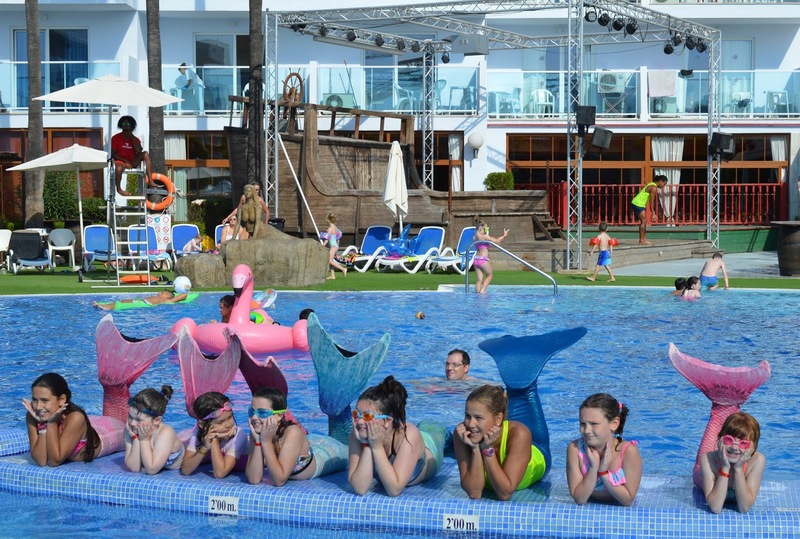 There were 7 mermaids taking part with two instructors in the pool, the manager was poolside (along with 10 parents) and two lifeguards were watching over them too. 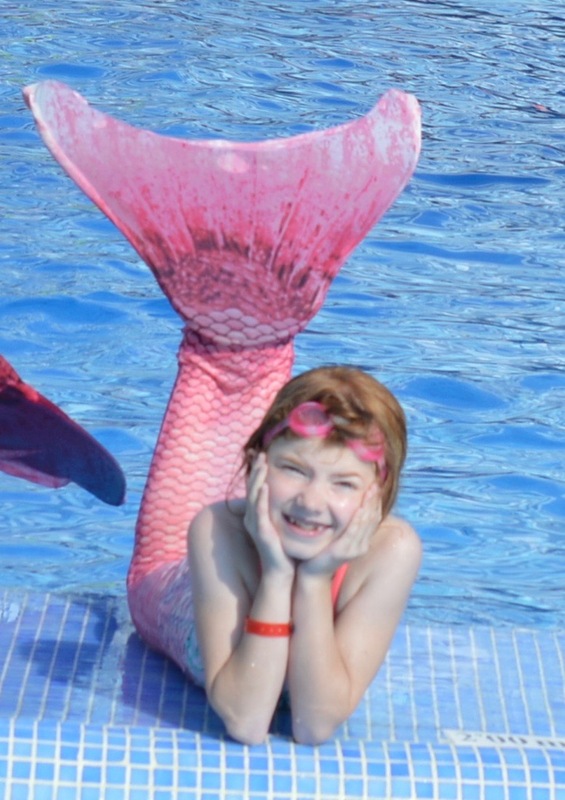 Next up, it was time to learn some mermaid skills. Heidi managed to complete a mermaid tail wave, could hunt and catch jellyfish and swim through tunnels by the end. As a parent, I felt really proud watching her. Finally, all of the mermaids learned how to climb a rock so they could sunbathe and chat with their friends and then how to slide off and make a quick exit should any pirates invade. 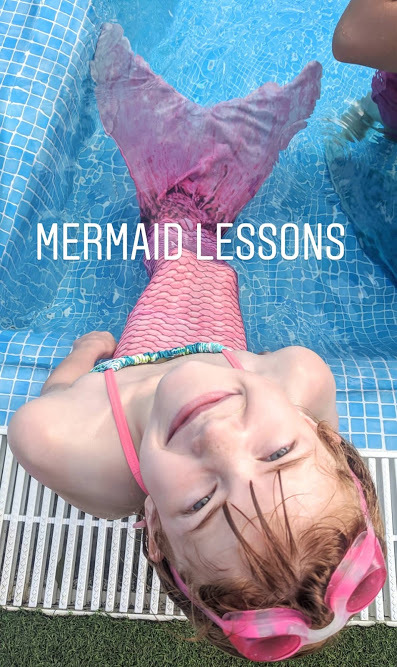 Mermaid lessons lasted around 45 minutes, were lots of fun and I'd 10000% recommend if your children are interested in this kind of thing. 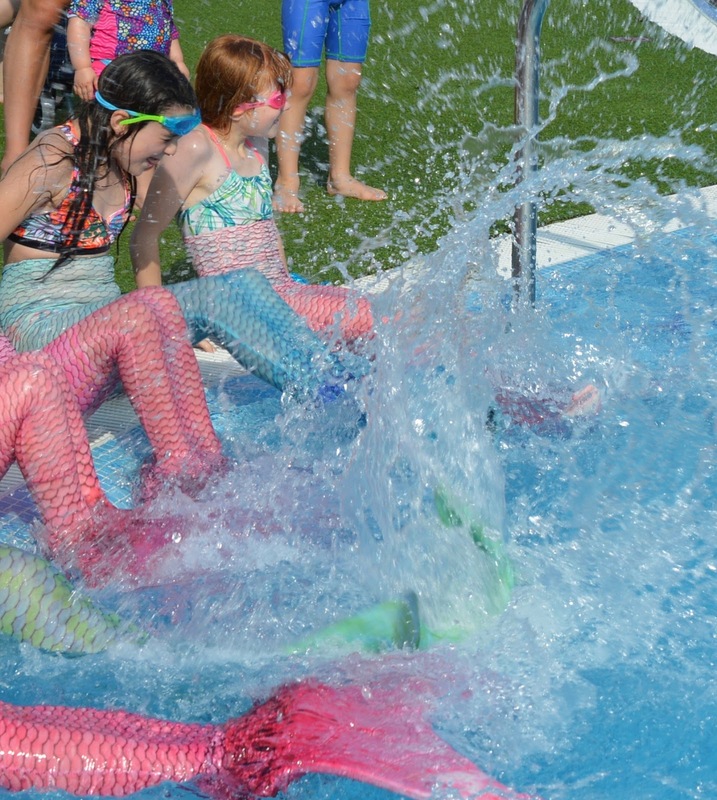 All participants were rewarded with a Mermaid School diploma which was waiting for them at reception. Let me know if you'd like to be transformed into a mermaid and try these lessons (or if your children would). They were such a fun addition to our holiday. Disclosure: We paid for our own holiday and lessons. 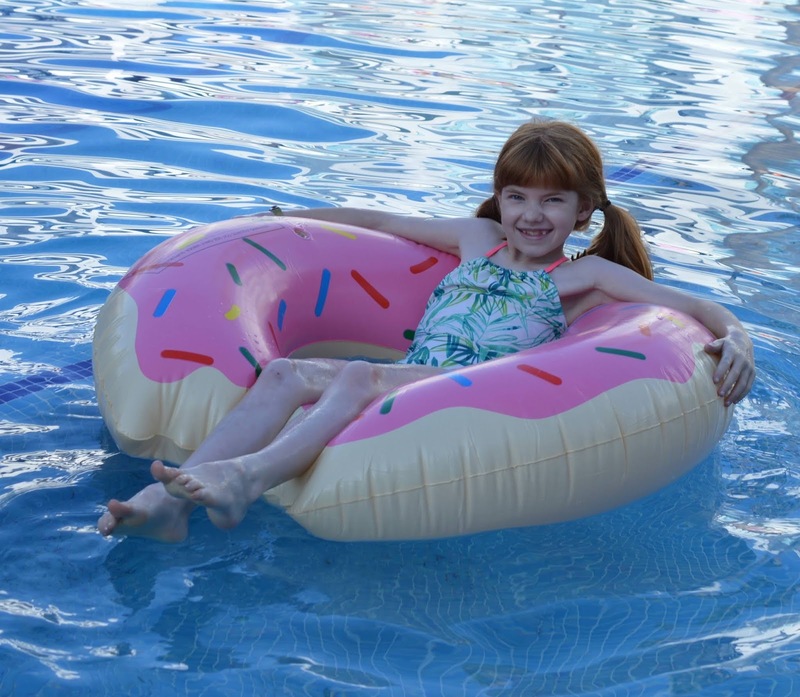 This post is a collaboration with Simply Swim.